Minister of State for Digital and the Creative Industries, Margot James, was in the West of England today to find out more about the region’s strengths in digital and 5G technology. 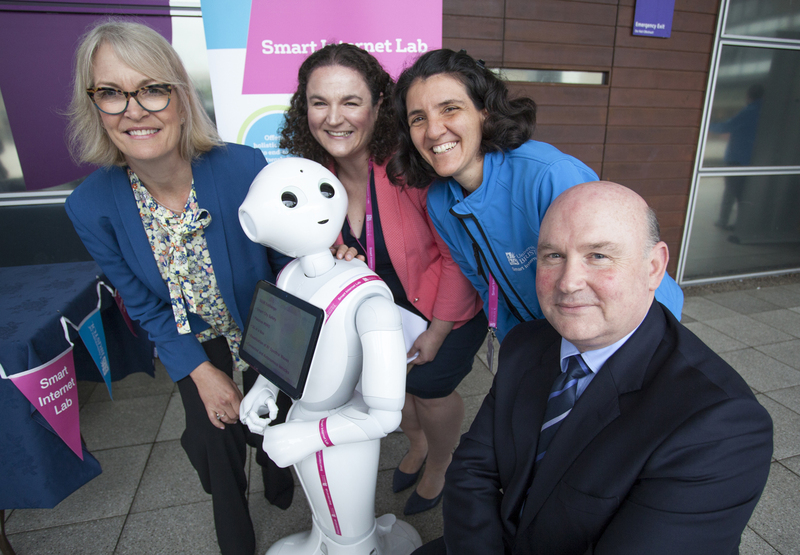 From left: Margot James MP, Minister for Digital and the Creative Industries; Ada* the robot; Maria Korea, Smart Internet Lab Manager University of Bristol; Dr. Raquel Frizera Vassallo, Research Fellow at the Smart Internet Lab; and Tim Bowles, West of England Mayor. Earlier this year the West of England Combined Authority secured £5 million from government to trial a superfast 5G network at tourist destinations in Bristol and Bath. The Minister met with the West of England Mayor Tim Bowles, before going on to see some of the new technology in action, with a visit to Millennium Square and the University of Bristol’s Smart Internet Lab, a key part of Bristol’s growing digital agenda. She also toured Engine Shed to find out about its work with young people, including the Engine Shed on Tour project delivered with Boomsatsuma, concluding with a tech roundtable. Mayor Tim Bowles said: “The West of England is well placed to become a smart region – we are home to the largest cluster of digital expertise outside London, and our businesses and universities are at the forefront of innovation in next generation networks including 5G. Margot James, Minister of State for Digital and the Creative Industries, said: “The next generation of connectivity has the potential to transform the digital economy and the Government is committed to ensuring the UK is fit for this 5G future. After meeting the Mayor, the Minister saw the 5G network already developed by the University of Bristol to establish experimentation capabilities for digital innovation. The University of Bristol’s Smart Internet Lab is driving the 5G agenda both locally and nationally and is one of three UK sites which delivered the world’s first end-to-end 5G system trials in March 2018, thanks to £16m investment from DCMS. It brings together more than 200 experts across the boundaries of communications and digital living research to explore how the internet could be scaled up to respond to rapid changes in the way we consume internet services. Engine Shed Director, Nick Sturge, talked about work underway to support scale-up businesses and activities to ensure opportunities in the growth sectors are visible and routes into employment accessible to all young people. She also met Boomsatsuma, a social enterprise with an alternative approach to training young people from diverse and challenging backgrounds. A tech roundtable with companies such as YellowDog, GapSquare, DigiLocal, Oracle, One Big Circle, A2Z and Interactive Scientific followed. *Ada is a humanoid robot with the ability to interact with people by listening, moving and talking while she tracks the person she is interacting with. Within the Smart Internet Lab, she will be of the agents acting in an Intelligent Space that will apply computer vision and 5G features to sense the environment and recognise gestures. Within this environment, she will be able to help or guide people, providing information about objects or issues they may have. Ada may later be used in public places, squares or historical sites to help people and tourists.